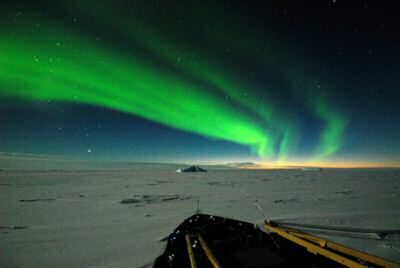 Enough about Antarctica cruises, you can find more about Antarctica cruises here. How cold does it get on Antarctica? Antarctica travel advice: always bring lip balm! If you travel to Antarctica, be aware that there are no trees to shelter: so if there is an Antarctic wind blowing, it will be cold and dry. This Antarctic winds can dry out your skin very easily, especially your lips, so do bring lip balm if you plan a cruise to Antarctica. 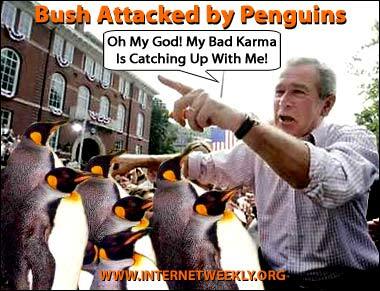 Bush attacked by Antarctic Penguins? 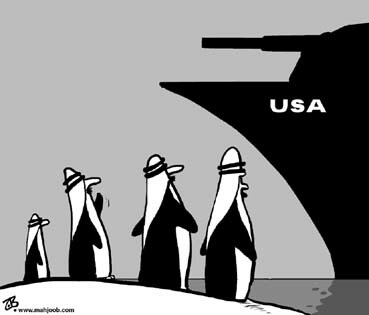 A funny look towards Antarctic penguins from the eyes of an Al Jazheera cartoonist. Anyway, since there is no (oil)mining allowed on the South Pole, nor are there land-claims possible on Antarctica: this cartoon is pure fiction. 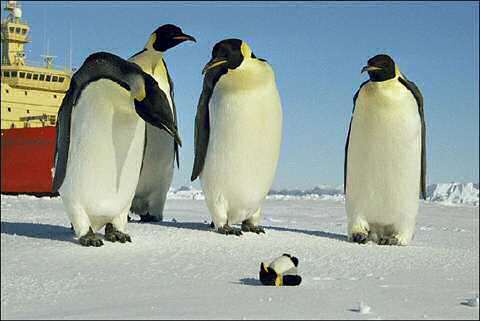 Which icebreaker left this penguin-doll behind? 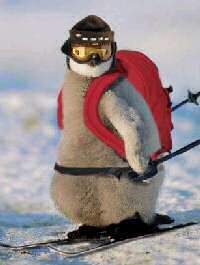 What is a Antarctica Penguins’ dresscode? MS Fram is the first of the Norwegian cruise ships that’s especially designed for cruising arctic waters. Ms Fram replaces the MS Nordnorge. Ms Fram’s interior offers you a warm wool and oak Nordic feeling: built in 2007 it is brandnew! It’s Antarctica expedition goes much more up close and personal compared to what people experienced on Nordnorge. Nordnodge was only designed for cruising the Norwegian fjords. From June 2008 MS Nordnorge will be replaced by the MS Fram. You can still sail on the Nordnorge when cruising Norway’s narrow fjords and sometimes icy polar waters. Antarctica cruises : Once the province of only the wealthiest adventurers, Antarctica is becoming accessible to more and more travelers. Nearly all of these South Pole travelers make the journey on a passenger vessel. The Antarctica cruise industry competition is clearly behind the boom that is bringing on line more and larger Antarctica ships. To cater to this booming industry, the Nordnorge designed for cruising the Norwegian fjords has joined the Antarctic waters. 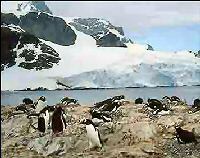 More than 15,000 people joined expedition cruises to Antarctica onboard a record 25 motor vessels and four large charter yachts during the austral summer of 2003-2004. Perhaps as many as 5,000 Antarctica visitors more passed along the fringes of the Antarctic Peninsula onboard larger Antarctica cruise ships such as Holland America Line’s Amsterdam, Princess Cruises’ Royal Princess and even The World of ResidenSea – the privately owned residential cruise liner. Although these Antarctica visits were sightseeing-only visits without actual landings, such voyages are likely to inspire some passengers to book more comprehensive Antarctica expedition voyages in the future. One of the more recent (1997-built) of the dozen ice rated vessels of the Norwegian cruise ships from the Norwegian Coastal Voyage fleet (replaced in 2008 by the MS Fram). The 11,386-gross-register-ton/404-foot Nordnorge Antarctica Cruise has 464 berths but accepts a maximum of 350 passengers for her 19-day "Antarctica & Chilean Fjords" program with eight departures (Buenos Aires to Santiago and reverse) between mid-November and early February. This comes as no surprise in view of NCV’s extremely attractive per-person fares, ranging for the 2004-2005 season from $4,445 to $7,445, including airfare from New York and pre- and post-cruise hotel stays. Rates for the 21-day February 23 voyage that includes the Falklands and South Georgia range from $5,010 to $7,965. 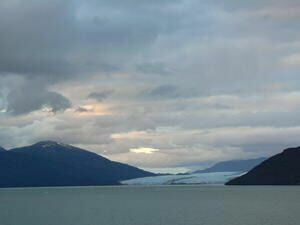 Antarctica Cruises commencing in Argentina, as mine did, begin with a LAN-Chile flight from New York to Buenos Aires. 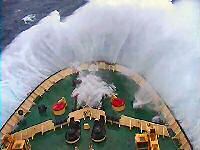 The thing you will most remember on board of your Antarctica cruise ship is the crossing of the notorious Drake Passage. Consider it an initiation ceremony for all souls bound for Antarctica Cruises. There are actually several Antarctica ships larger than the Nordnorge operating expedition cruises to Antarctica. including the Discovery (ex Island Princess), Saga Rose, and Marco Polo. 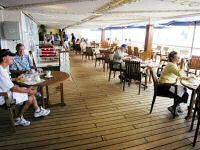 But the Nordnorge is clearly the best suited for the task among the big cruise ships. Designed for year-round service in Norway’s narrow fjords and often-icy polar waters, she features powerful bow and stern thrusters for amazing mobility. Plus there’s a cargo deck just above the waterline that adapts nicely for use as a changing area and loading ramp for the Antarctica ship’s fleet of Polar-Cirkel boats. There’s room on this deck as well for protected storage of these inflatable craft, which are similar to Zodiacs. Interior decor and cabin layout is comparable to most modern mid-range Antarctica cruise liners, featuring lots of brass, glass, and rich veneers. Antarctica cruise cabins are a bit snug compared to most newer Antarctica cruise ships, but generous next to those of the typical expedition vessel. Breakfast and lunch are served smorgasbord-style from a bountiful buffet while dinner on this Antarctica cruise is a sit-down affair with two seatings. Food is tasty and plentiful, although a few passengers complained about the limited choice of entrees (two) at dinner. The wine list is a good one with a number of agreeable selections under $20 a bottle. The cafeteria serves as a round-the-clock source of coffee, tea, and flight snacks. 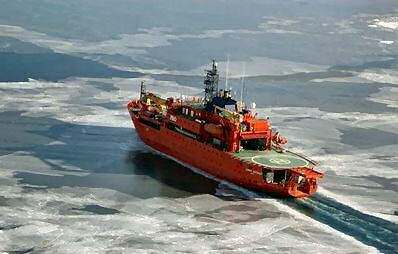 In fact, the Nordnorge Antarctica Ship has no showroom, casino, or swimming pool. There’s a no-frills gym and sauna, a small library, and a shop stocked with Antarctica travel essentials and Antarctica souvenirs, but that’s about it for this Antarctica ships’ amenities. The vessel does receive satellite television, both in the suites and at wall-mounted sets in the cafeteria. Passengers seemed keen on following world events, though we eventually lost the signal some where about 62 degrees south. Most likely no coincidence that beyond that point, we were surrounded by icebergs, whales, seals, and penguins, so nobody missed the TV. 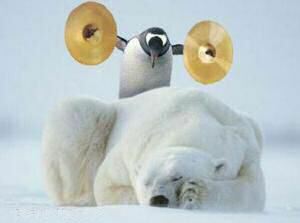 Once you are in Antarctica, you better enjoy the continent the fullest without any distractions! Having done an Antarctica cruise previously on a much smaller Antarctica ship, I was concerned at first that the process of shuttling 265 Antarctica visitors ashore via the eight-passenger Polar Cirkel boats would be tedious and that time ashore would be too limited. Such was not the case in this Antarctica cruise however, thanks to the well-organized efforts of Antarctica expedition leader Tomas Holik, an Argentine ecologist and veteran Antarctica expedition boss. We always had a minimum of an hour ashore with this Antarctica cruise, and in frigid conditions this proved more than enough for the majority of the Antarctica passengers. The Nordnorge Antarctica Cruise ship usually calls at the Henryk Arctowski Antarctica Station. This is an Antarctic visitor-friendly base operated by the Polish Academy of Sciences that features a particularly stylish and informative information center about Antarctica. Ukrainian researchers continue to monitor the ever-expanding ozone hole and happily share their up-to-the-minute findings with any visitors. More than icebergs and research stations, it is penguins that people come to Antarctica cruises to see. Port Lockroy provides a history lesson on an otherwise nature oriented Antarctica expedition cruise. Built by the British in 1944 as "Base A" of Operation Tabarin, this was an Antarctica wartime intelligence post aimed at tracking German U-Boats in the Southern Ocean. After the war it was put to use as an Antarctica research station and operated as such until 1962. Ring-shaped Deception Island was our final shore call in our Antarctica cruise and was, perhaps, the most fascinating of all Antarctic scenes, as we sailed into the island’s huge internal crater, altered as recently as 1970 by volcanic eruptions. A few hardy bathers took a dip in the frigid Antarctic waters and then wallowed in warm springs that line the beach of black volcanic sand. Five full days went by like a flash but not without some last minute fanfare. 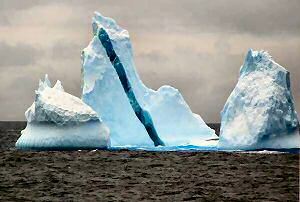 It was quite a show and soon followed by the sighting of a gigantic tabular Antarctic iceberg. 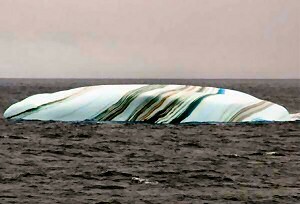 One would have thought it was an island : several kilometers square and taller than our Antarctic ship. Most of the longer Antarctica cruises include stops in the Falkland Islands and South Georgia Island en route to or from the peninsula. NCV has chosen to combine eight of its nine Antarctic cruises with a weeklong voyage through the islands and fjords of southeastern Chile. Many of the Antarctica cruise passengers joined an optional tour here, visiting the resort town of Puerto Varas on Lake Llanquihue and Vincente Perez Resales National Park. There the cruise took in the scenic splendour of Petrohue Waterfalls and emerald green Lago Todos Los Santos (All Saints Lake), with snow-covered Orsono and Calbuco volcanoes in the background. It would appear that Norwegian Coastal Voyage Inc. has come up with a winner, matching one of its nifty Nordic Antarctica cruise liners to a new itinerary. These kind of cruises seems to suit her perfectly: a happy coincidence that has resulted in the best value available today on the WHite Continent, plus Chile to boot! Based on Norwegian Coastal Voyage heads way down under to do White Continent right Cruise Travel, Nov-Dec, 2004 by Dave G. Houser. Hurtigruten, formerly known as Norwegian Coastal Voyage has replaced the MS Nordnorge with their newest MS Fram: a 2007 built Antarctica cruise ship especially designed to cruise the Arctic waters. 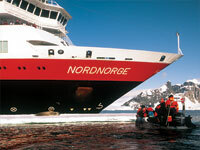 The Nordnorge was originally designed for cruising Norway’s narrow fjords and sometimes icy polar waters. From 2002 it has been used to travel to Antarctica as well but from June 2008 onwards, the Nordnorge will be cruising again its traditional Norwegian coastal voyage route along the Norwegian fjords. Read an Antarctica Travel Experience on the Nordnorge. Where Nordnorge was designed to sail the Norwegian fjords and icy Arctic waters, the MS Fram is especially designed to cruise the Antarctic waters. Being 10 years younger than the Nordnorge, the interior of the MS Fram looks much more appealing to the modern day traveler. The extensive use of wool, leather and oak gives the interior of the MS Fram a warm Nordic feel. Outside the Antarctica travel season, the MS Farm cruises the Greenland sea. This explains why the MS Fram interior is decorated with works by esteemed Greenlandic artists. Travelpro is a luggage company that provides travelers from all walks of life with durable, quality and functional travel gear. No matter if you are a pilot, a business professional, a leisure traveler or a student, there are plenty of luggage options to choose from that can meet your needs and your expectations. Fro more than two decades, Travelpro has designed innovative and durable luggage of the highest quality. It is a popular brand, not only among everyday and business travelers, but also flight crews as well. Of course, quality isn’t the only factor that makes their products fantastic, it is also the diversity they offer that make them a top choice. For instance, you can choose from carry-on luggage, rollaboard and expandable rollaboard luggage, duffels, garment bags, deluxe totes, rolling totes, rolling computer briefs, business/computer briefs, and backpacks. Moreover, all of their different suitcases, briefcases, bags and backpack styles are available in different collections. Thus, there are plenty of options and designs to select from. In addition, Travelpro products come with a warranty, are lightweight, stylish and incredibly practical. Hence, you can travel in style, have peace of mind knowing your belongings are well protected and organized, and depend on luggage that will last you for years to come. Amazing picture of a smiling Weddell seal enjoying the sun in Antarctica, taken from aboard a vessel during my Antarctica tour. 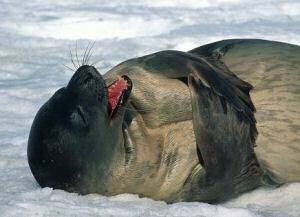 Weddell seals are appealing because of their smiling faces. You can easily approach them when you find them sun bathing in large groups on fast packs of Antarctic ice. 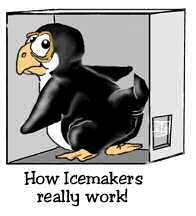 They only emerge through cracks and blowholes in the Antarctic ice to breathe, rest, and have their pups. To see Weddell seals in Antarctica you need to book your vacation on Antarctica ships that sail the closest to the South Pole. Weddell seals live in the waters of McMurdo Sound about 800 miles away from the South Pole and are only seals to represent the Antarctica wildlife so far south. Weddell seal pups weigh up top 60 pounds (30kg) at birth. After a nursing period of 6 to 8 weeks, the pups will have gained an extra 200 pounds or 100 kg and will be able to swim, hunt, and to haul themselves out of the water. Arctic Weddell seals are named after the British Antarctic explorer James Weddell, who commanded British Antarctic expeditions into what is now called the Weddell Sea (which is also named for him). Weddell seals live farther south than any other mammal and can only be seen when you book an Antarctica cruise on an arctic cruise icebreaker that sails all the way south. 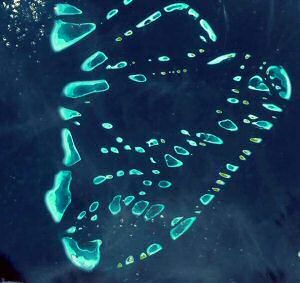 Now that ocean sea ice around Greenland and Antarctica is melting and oceans simply expand because their temperatures are increasing, some of the Maldives islands could be vanished within 10 years from now. Over the last 7 years, satellite measurements have shown that the sea level has been rising at 3.3mm (0.13inch) per year. 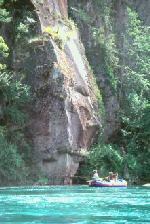 This is double of what was recorded in the 1900s. The average height of the 1,200 atoll Maldives islands is only about 1.5 meters or 4.8 feet. Maldives hasn’t much to protect itself from storm surges, nor rising sea levels rise. Repeated storm damage already denudes the Maldives islands, especially when the reefs protecting the atolls die from ocean acidification. The Maldives may, or may not, prove to be the winners of the Carbon World-Cup : the race to see which country actually becomes the first to be completely carbon neutral. The Maldives recently announced aiming to be carbon-neutral within ten years. Other entrants are other popular vacation destinations: New Zealand, Costa Rica, Iceland, Norway and Monaco. The Maldives have much at stake, in fact their future may very well depend upon every country entering the Carbon World-Cup. The Maldives Islands will be among some of the first and worst affected low-lying islands to suffer ocean inundation as the sea levels rise. Sea levels rise because carbon gasses shield the earth from cooling down, hence Antarctica will melt faster.